While in Puerto Jimenez, I talked to activists, business owners and local residents whose livelihoods depend on the gulf, and would be severely affected by such a large project, and Daniel and his colleague Ifi (head of ASCONA) were a huge help. They introduced me to people, showed me around town, and last Wednesday, Daniel helped me in quite possibly the most effective and adventurous way possible; he took me kayaking on the gulf. Daniel and I, along with Ivan, an ASCONA volunteer from Madrid, Spain, took to the water at around 2:00pm. It was hot and humid with the hint of a nice breeze due to approaching rain clouds. Daniel took us out to the middle of the gulf in order to show me the site of the potential marina, and hopefully catch a glimpse of some dolphins or humpback whales, frequent visitors of these warm waters. 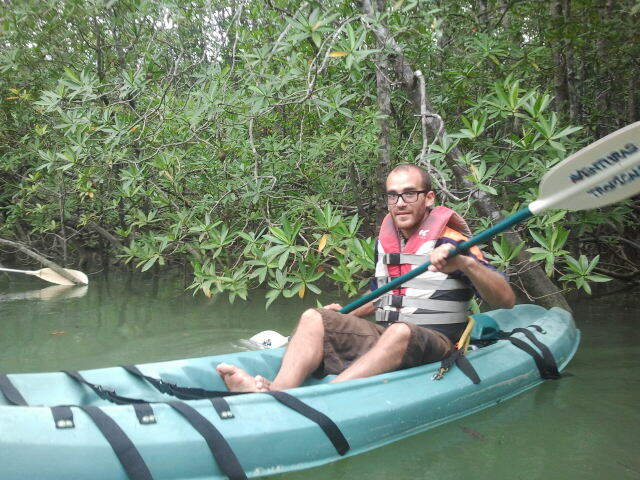 After explaining to me the importance of the fragile ecosystems that thrive in this relatively small body of water, Daniel then led us into a mangrove forest to show me the real treasure behind life on the gulf and all that surrounds it. These extremely fragile forests serve as the link between salt water from the gulf and fresh water from the rivers. As the mangroves need a small amount of salt to survive, but can’t thrive in the salty ocean water, their stems and leaves act as filters, which capture salt and result in a lush display of life which so much wildlife is dependent on. Among the seven species found in Costa Rica, we encountered three types of mangroves in our two-hour expedition: red mangrove, tea mangrove, and mangle caballero (literally: gentleman mangrove). Daniel did a wonderful job explaining the differences between the three and each mangrove’s role in the local ecosystem, pumping life to thousands of different species of plants and animals. We even came across a crocodile nest! A marina on such a scale in the middle of the gulf would negatively affect the intensely diverse environment on and around the Gulfo Dulce. 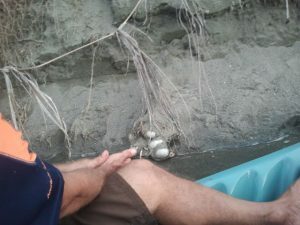 Between the operations of the marina and the increase in boating activity in this fragile ecosystem, this project could be detrimental to a plethora of important wildlife on the Osa Peninsula as well as bring dramatic change to the local community by opening the gates to large-scale development that the people don’t necessarily want to see. Daniel, as a resident, an activist and someone who depends on these waters to maintain a comfortable life, believes the most upsetting aspect of the marina is picturing the destruction of his homeland by ill-conceived development projects that benefit a few people at the expense of the rest. 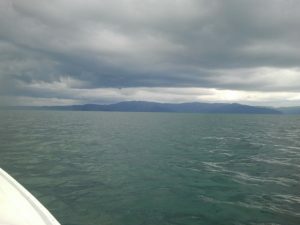 This entry was posted in Community Outreach, Marine Conservation and tagged ascona, Conservation, Dulce, Golfo, kayak, marina, osa, Peninsula, Wildlife. Bookmark the permalink.